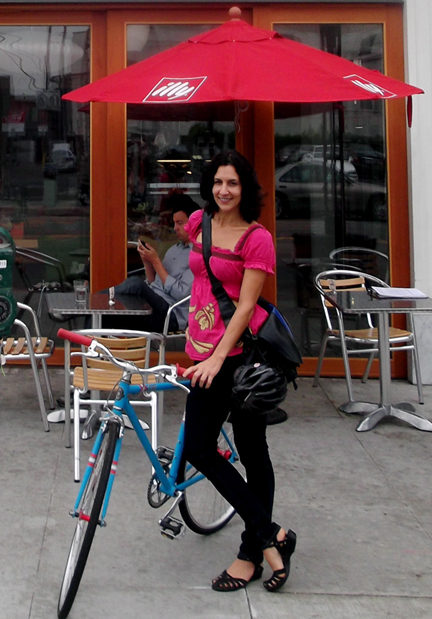 In October 2010, the City of Long Beach embarked on the nation’s first Bike-Friendly Business District program with grant of $72,000 from the Los Angeles County Department of Health. The city wanted to increase bicycle trips to local business districts and, hopefully, as a result, increase their number of customers. It hired my company, Green Octopus Consulting, to figure out how to do this, in partnership with the four districts written into the grant – Bixby Knolls, Cambodia Town, the East Village Arts District, and 4th Street Retro Row. Became Educated on how bicycling helps their districts economically. Most business owners had reservations about bikes at the outset and were unaware of the economic benefits. Started a Discount Program called Bike Saturdays, whereby customers who ride their bike receive a discount every Saturday. Currently, the program has 145 business participants, about 300 known users a month (average of two per business) and 400 Facebook and 200 Twitterfollowers. This program has also brought the businesses new customers on days other than Saturday, customers who forget to ask for the discount, and customers who walk in instead of bike. All of these situations bring the participants new customers, sales and publicity. Offered free bike tune-ups to more than 195 bikes at 19 clinics. The ones held inside bike shops brought the shops more than 45 new customers (combined) and more than $2,000 in combined sales, because, while waiting, they’d realize they need a helmet, bike lights, or other accessory. Installed bike racks for more than 50 businesses that didn’t realize the city provides a free bike rack to any business who requests one and that the liability associated with the racks lies with the city, not the business. Built bike valet kits for each district and parked more than 235 bikes at 16 events. Bike valets are a welcoming touch at events and also a friendly nudge to bike, not drive. Piloted sidewalk stencils that say “Walk Bikes”to reduce bike-pedestrian accidents and help educate bicyclists that it’s dangerous and illegal to ride on Long Beach business district sidewalks. Held seven community rides to get new people on bikes and introduce them to the local districts. “The DENGUE FEVER community bike ride, where these rock stars were riding around in our new cargo bike with our Cambodia Town logo, was so much fun. It brought together diverse community leaders, including our councilperson, as well as others from throughout the city that had yet to discover our district. Bicycling has been part of Cambodian culture for decades, and it was neat for us to celebrate this in Long Beach, which is home to the largest Cambodian population in the U.S.” -Pasin Chanou, chair, Cambodia Town, Inc. Created partnerships and held special events, like the bike-themed March 2010 East Village Arts District Second Saturday event, whereby four shop openings and re-openings were timed for that night, a BMX art installation of rideable Egyptian pyramids was created and ridden, and store discounts and two free bike valets were offered to bicyclists, all of which increased event attendees, business sales, and publicity for the district beyond the event. We also participated in Park(ing) Day, recruited famous bicycling advocate Mia Birk to speak at a BFBD bookshop, promoted Small Business Saturday in the BFBDs, held a bike fair, partnered with photographer Shereef Moustafa to offer free Long Beach Bicycle Portraits, and partnered with Long Beach Pedaler Society to provide new delivery service for a BFBD restaurant and complimentary pedicab rides at our events. Promotion and publicity to educate the public via print advertising, city and business association websites, flyers, posters, postcards, social media, videos and in-person outreach. We also secured significant media coverage in local and national outlets. The Long Beach program has caught the attention of cities, merchants groups, and media outlets around the U.S., and it is our hope that BFBDs will sprout up around the nation. They’re a healthy solution for our communities and local businesses. April Economides, principal of Green Octopus Consulting, was hired to create and manage the BFBD program for the City of Long Beach. She gives talks and trainings on BFBDs and the economic case for bicycling to business and civic groups. She holds an MBA in Sustainable Management and is an avid bicycle commuter.